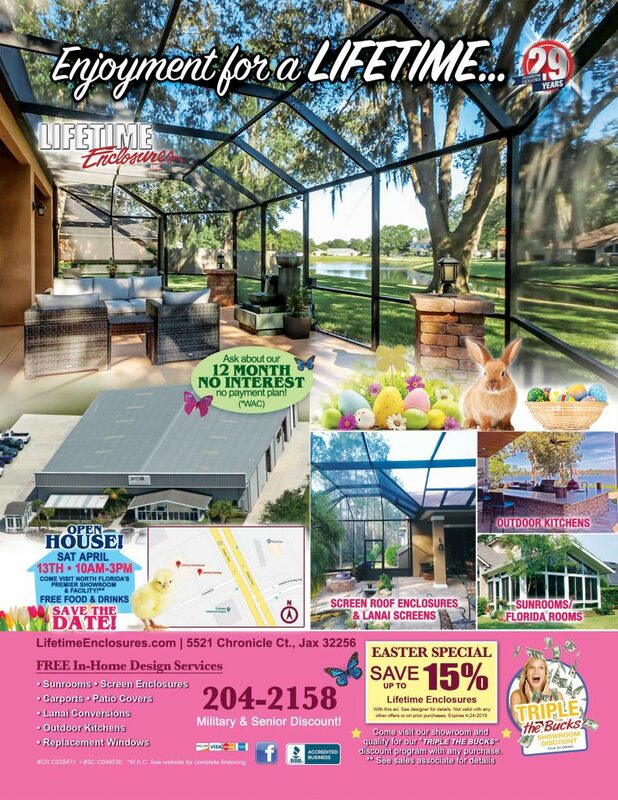 Explore Enclosures, Sunrooms, Carports and More! Yes, I am interested in finding out why a Genuine Lifetime Enclosure is the best enclosure value available today! Please Note: At the present time we are serving homeowners in North Florida and South Georgia only. Visit Aluminum Association of Florida Website &lpar;www.aaof.org&rpar; for a preferred contractor in your area. Complete the form to instantly download our Free Brochure. For over 28 years, our experienced team of designers have created enclosures to fit our customers vision and budget. You can take comfort in knowing we use only the highest quality materials and skilled craftsmen who are dedicated to excellence. 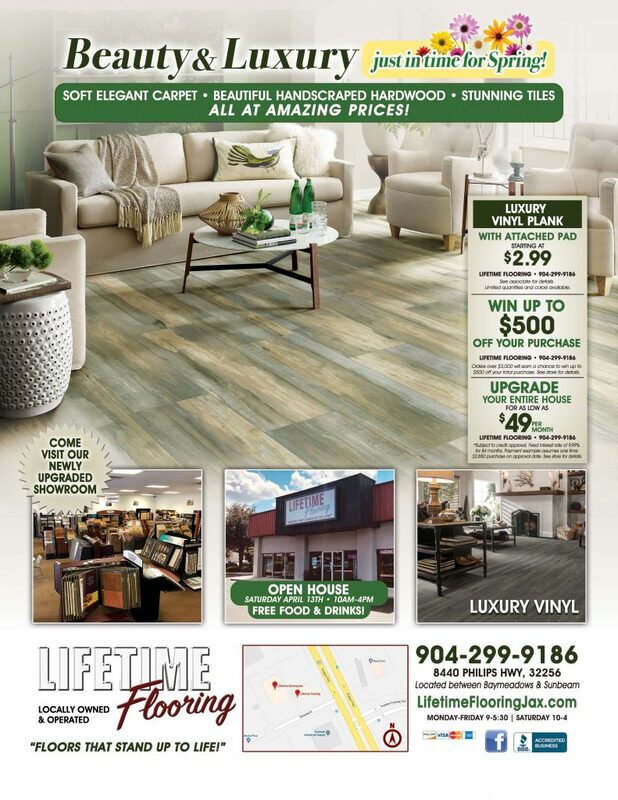 Come visit our showroom and see the LIFETIME difference! Come See the LIFETIME Difference! Enhance your lifestyle, and add to the beauty and value of your home with one of our custom enclosures. We build sunrooms, screen and glass enclosures for pools and lanais, patio covers, carports and much more. Our enclosures turn your home into a year-round vacation spot and are a great way to extend your entertaining and living areas. 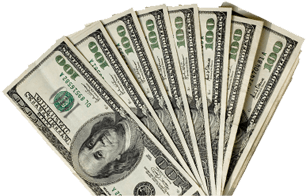 With 100 percent financing available, we make it easy to turn your home improvement dreams into reality. For over 28 years, Lifetime Enclosures has been the premier enclosure source for Jacksonville and all of Northeast Florida and Southeast Georgia. Our experienced team of designers will create an enclosure to fit your vision and your budget, and you can take comfort in knowing we use only the highest quality materials and skilled craftsmen who are dedicated to excellence. Additionally, many of our products come with a limited lifetime manufacturers warranty, providing you with worry-free enjoyment. Request a quote with our online form or call our office today for a complimentary in-home design consultation, and start enjoying your home to its fullest with a Lifetime Enclosure. LIFETIME Family Open House this Saturday!! Take a look at these!!! Open house THIS Saturday!!! See you there! Quality A&plus; work by Installer Brad. Had vinyl windows added to existing screen enclosure previously installed on covered patio lanai by Lifetime Enclosures. Very pleased with product and service provided. The Company’s office, sales, and installation personnel are professional and pleasant to deal with. Highly recommend using Lifetime Enclosures for your patio/porch/deck improvement projects. Everybody was excellent, the crew was polite, very professional. You went above and beyond for my wife’s birthday. I understood the red tape involved with permits and would still give the same rating on your service, but you worked a miracle. I am forever grateful. Thank you and your company very much for the concern and hard work that was given to me and my husband. It means so much to know that there’s a company with integrity that really cares and show it to their customer’s. It’s all well appreciated and I look forward in continuing business with Lifetime Enclosures in the future. Overall a great job. I am very pleased with everything. I am very impressed with how professional, polite and helpful the folks that helped me were! Thank you! My wife and I are 100% pleased with the finished product. Lifetime exceeded our expectations. We are very pleased with our room and also with the quick response we received with regard to any follow up on minor issues. Experience second time around, still excellent craftsmanship but thought much more communication and responsiveness. We are so pleased with the quality of construction and the professionalism of Mike & his crew. We are so happy with it looks wonderful. Thank you!! I was very pleased with my screen room and the professionalism, helpfulness and friendliness of the staff. Great construction! Very pleased with the product. Sales and information was great. Installation crew was great and knew what they were doing- they did an excellent job. From the salesman to the installation crew-all were polite and knowledgeable. We are enjoying the porch and very proud of the work they did! My wife has been wanting to screen in our porch area to have a pleasant additional living space. Lifetime Enclosures provided us a great product at a reasonable price. We now have better living space. Mike and Bryan did a fantastic job installing our screened in porch. For more than 28 years, Lifetime Enclosures has serviced the Greater Jacksonville Area and Northeast Florida and Southeast Georgia. We use only the highest quality materials and skilled craftsmen who are dedicated to excellence.